If someone wanted to use a Venn diagram to illustrate what is wrong with the U.S. health care system, picking the different sets would be easy: Price gouging, abuse of loopholes, hidden risks to patients, baffling regulatory decisions, marginal efficacies and the use of doctor payments to stimulate drug sales would be some logical choices. And a case in point would be Corcept Therapeutics, a specialty pharmaceutical company based in Menlo Park, California, and the apparent union of all things expensive and opaque. So how did Corcept, a small company with just one drug aimed at treating a tiny population of patients with a rare pituitary disorder, wind up there? Corcept has managed to make handsome profits by quietly yet efficiently exploiting gaps in the nation’s health care regulatory framework. And its sole drug is none other than the storied mifepristone, better known as the abortion pill. While Roussel-Uclaf developed mifepristone in France in 1980, it became famous in the U.S. in 2000 when the Food and Drug Administration ruled that doctors could prescribe it to induce an abortion; it was sold as RU-486. Just before that, two doctors at Stanford University Medical School’s psychiatry department began examining mifepristone for quite another use. In the mid-1990s Dr. Joseph Belanoff began testing a longstanding hypothesis of then-department chairman Dr. Alan Schatzberg that mifepristone could block the body’s production of cortisol and be used to help treat episodic psychosis, a condition that’s found in about 15 percent of people with major depressive disorder. Encouraged by the results they observed in the few patients they tested, the doctors founded Corcept in 1998, with Stanford University’s technology licensing office serving as a silent third partner; the university had applied for a patent covering mifepristone’s use in treating depression. But a preliminary study of mifepristone, released in the journal Biological Psychiatry in 2002, kicked off the academic equivalent of a food fight when several veteran psychiatric researchers argued that the test results provided no statistical backing for Schatzberg’s claims. One high-profile critic told the San Jose Mercury News in 2006 that the study was an “experimercial,” or an experiment whose purpose was to generate publicity rather than meaningful results. These critics were onto something: In 2007 Corcept halted its clinical trial for the drug’s treatment of depression and did not publish the results, a development that usually means that the findings were not positive. Faced with the prospect of the company’s business model collapsing, Corcept’s management managed to pull off what an April 2018 Kaiser Health News article called a “Hail Mary” when it sought — and received — Food and Drug Administration approval to test mifepristone as an orphan drug for the treatment of Cushing’s syndrome. Endogenous Cushing’s syndrome is a pituitary gland disorder whereby the body is prompted to make too much adrenocorticotropic hormone, which governs the level of cortisol. And people with hypercortisolism — who overproduce cortisol — might have their metabolic functions go awry; this could lead to a host of painful and dangerous symptoms like rapid weight gain, skin discoloration, bone loss, heart disease and diabetes. 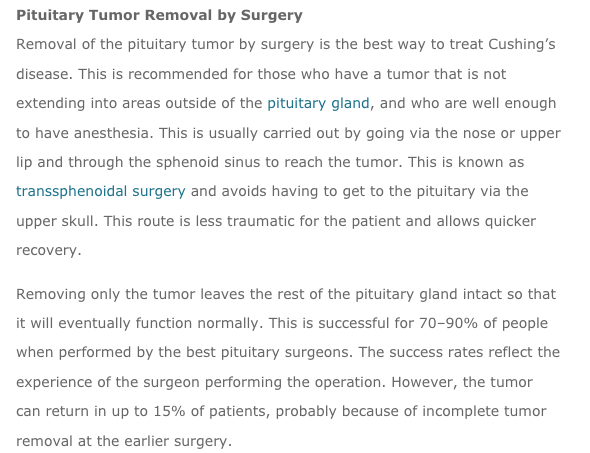 The primary culprit behind endogenous Cushing’s syndrome is a tumor that grows on the pituitary gland; in 70 percent to 90 percent of these cases, surgery to remove the tumor can successfully address the condition, according to the Pituitary Society. But for as many as 30 percent or so of the people with Cushing’s syndrome (individuals who can’t undergo surgery or for whom surgery doesn’t mitigate these symptoms), Corcept developed a mifepristone treatment. And on Feb. 17, 2012, the FDA approved Corcept’s application to market its mifepristone medication Korlym as an orphan drug. The label, or the official designation for what it was approved to treat, is very specific: Korlym is to be prescribed only to people with endogenous Cushing’s syndrome who have both hypercortisolism and diabetes in order to reduce side effects of hyperglycemia, or high blood sugar levels. The fact that the FDA had granted an approval allowing the company to market Korlym, however, doesn’t mean Corcept had scientifically demonstrated the drug’s success in treating Cushing’s syndrome. Southern Investigative Reporting Foundation readers may recall from previous reporting on Acadia Pharmaceuticals that the FDA can sharply relax evidentiary standards when confronted with a small patient population possessing a rare disease. Indeed, the FDA approved Korlym based on a single open-label study consisting of one group of 50 patients. (An open-label study is the least rigorous type of scientific investigation.) All participants in the study knew they were receiving the drug — and not a placebo — which risked the possible introduction of bias. And the study lacked a comparison group, whose results could be contrasted with those of the drug’s recipients. 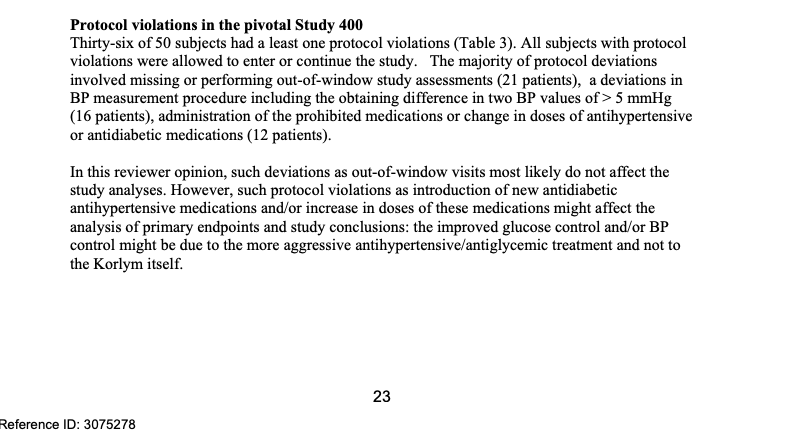 Plus, 36 of the 50 study participants reported protocol violations. When the company tried to expand Korlym’s sales by seeking approval to market it in Europe, other problems emerged. In March 2015 Corcept withdrew its application for Corluxin (a renamed Korlym) after receiving a final round of questions from a committee of the European Medicines Agency and declining to answer them; the company cited “strategic business reasons” for ending the process. The European Medicines Agency had a starkly different view of events. In a brief “question and answers” release posted online in May 2015, the agency’s committee said its “provisional opinion” was against approving the drug. Three weeks later in a more formal assessment, it cited a laundry list of concerns, including the company’s failure to control the introduction of impurities during manufacturing, the design of the clinical trial and “limited” evidence of effectiveness. 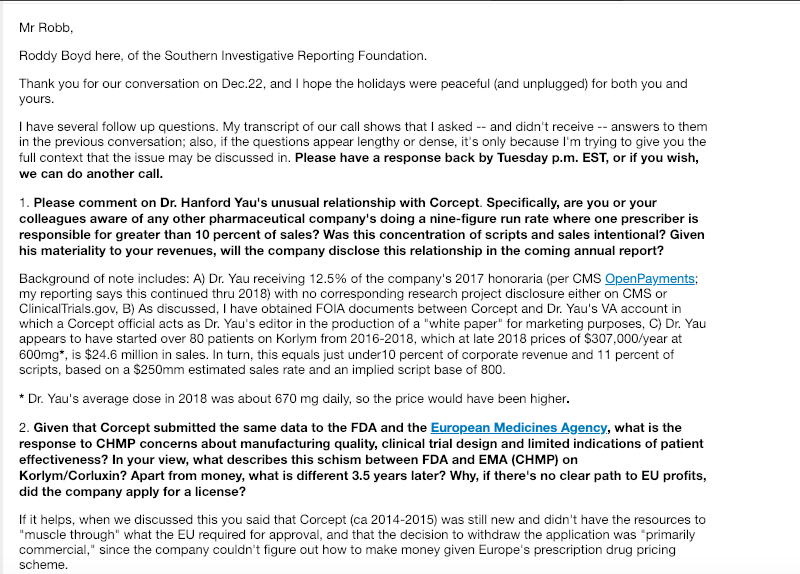 Robb did not respond to a follow-up call and email with questions from the Southern Investigative Reporting Foundation about why Corcept spent the time and money to pursue approval of its drug all the way to the last stage of the process before realizing it couldn’t make money in Europe. A brief aside: Adverse event reports are a tabulation of patient responses to a drug. The reports are unverified and are not designed to replace a formal investigation or autopsy. This completely voluntary reporting system allows for a wide array of filers, and with family members, caregivers and trained medical professionals able to make submissions, the level of accuracy and detail varies widely. Finally, many medical professionals have suggested that because this documentation is voluntary, incidents involving newer drugs are not reported to FAERS. Ashfield officials did not return a call seeking comment. Nonetheless, as Corcept’s recent income statements show, the company has certainly figured out a way to make quite a bit of money in the United States from selling this drug. 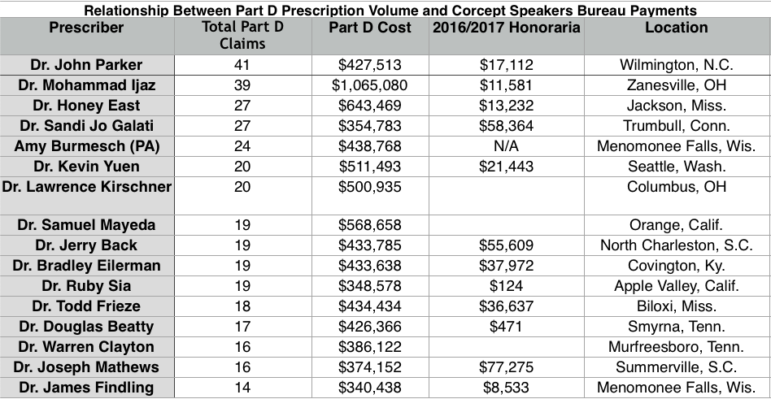 Corcept’s road to success in this country has followed the tried and true specialty pharmaceutical playbook, raising a medication’s price steeply and often, while using physician speakers bureau payments to build drug awareness. The public battering of other specialty pharmaceutical company CEOs after they tried to defend price increases might have given Corcept’s Dr. Belanoff the idea of acknowledging unpleasant facts first — before others do. Thus in April 2018 Dr. Belanoff told Kaiser Health News, “We have an expensive drug, there’s no getting around that,” perhaps in an effort to diffuse some of the sticker shock of his drug’s price tag, which he later cited as $180,000. But that’s not anywhere close to a person’s cost for a year’s worth of Korlym prescriptions. Dr. Belanoff’s quote is only for the annual price for prescriptions of 300 milligrams, which is half the suggested 600-milligram daily dose. A more accurate yearly cost would be $308,000. And the annual expense for a patient will probably rise since, as Dr. Belanoff noted in a recent conference call, Corcept expects the typical prescription to eventually be 730 milligrams daily, the dosage explored in the FDA study. Taxpayers are playing a growing role in Corcept’s expansion plans. According to Medicare Part D coverage data, in 2016 (the most recent year for which statistics are available), the government forked out $23.1 million for 1,086 prescriptions in the United States, a steep increase from 2015’s $11.4 million expenditure. All told, Medicare Part D payments accounted for just slightly more than 28 percent of Corcept’s revenue in 2016, a jump from 14 percent in 2015. A savvy observer might suspect that Corcept is using its speakers bureau program to compensate doctors for prescribing Korlym. To be sure, the concept of a speakers bureau is a fully legal, well-used strategy employed by many pharmaceutical companies. 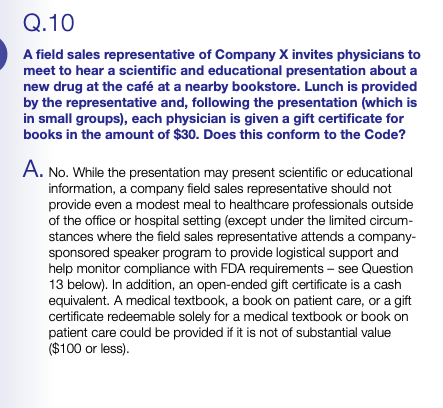 Done by the book, these programs serve both marketing and educational purposes: Doctors are compensated for their time in preparing presentations and discussing their experiences of administering a medication to their patients, and other physicians can hear a discussion about the drug at a level of sophistication that a sales representative would be hard pressed to match. But in practice, as the Southern Investigative Reporting Foundation found after its investigation of Insys Therapeutics, speakers bureau programs (if not carefully monitored) can devolve into frequently questionable, if not illegal, quid pro quo inducements. Could these doctors based in smaller communities with a limited pool of patients to draw from be prescribing Corcept to patients merely with diabetes — instead of endogenous Cushing’s syndrome? In addition, Robb said that as awareness of Korlym grows, doctors will realize that more of their patients have Cushing’s syndrome, and the clustering of Korlym prescribers in smaller communities happened only because one group of physicians recognized earlier than their colleagues how the disease could be treated. Pressed on the unusual odds of so many prescriptions for a treatment of such a rare disease from doctors in Zanesville, Ohio and Murfreesboro, Tennessee, Robb declared that “over 90 percent” of all Korlym prescriptions were “on label.” He added that “since it’s an expensive drug,” nearly all commercial insurers have an extensive preapproval process before paying for the drug. Speaking more generally about Corcept’s marketing efforts, Robb said a company has a lot of work to do when selling a medicine for a rare disease like Cushing’s syndrome. “It is just not the case that you can walk into a doctor’s office, drop off some brochures and come back later and suddenly they’ve got a Cushing’s syndrome patient. It takes five to seven visits” for physicians to become aware of the disease, he said. “I know the meal [served during the presentation] is modest,” Robb added. “It’s held at your local Holiday Inn or whatever and it’s entirely compliant with the PhRMA code.” The code he referred to is a set of voluntary ethical guidelines for drug companies adopted in 2002 by the Pharmaceutical Research and Manufacturers of America, frowning on sales representatives using gifts to doctors or providing them meals or entertainment as a means of drumming up business. “We’re not flying people to Hawaii to hear about our drug,” Robb said. Robb’s full-throated defense of Corcept’s business practices would make more sense if not for the company’s relationship with Dr. Hanford Yau. An endocrinologist, Dr. Yau sees patients at an Orlando Veterans Administration Medical Center’s clinic. 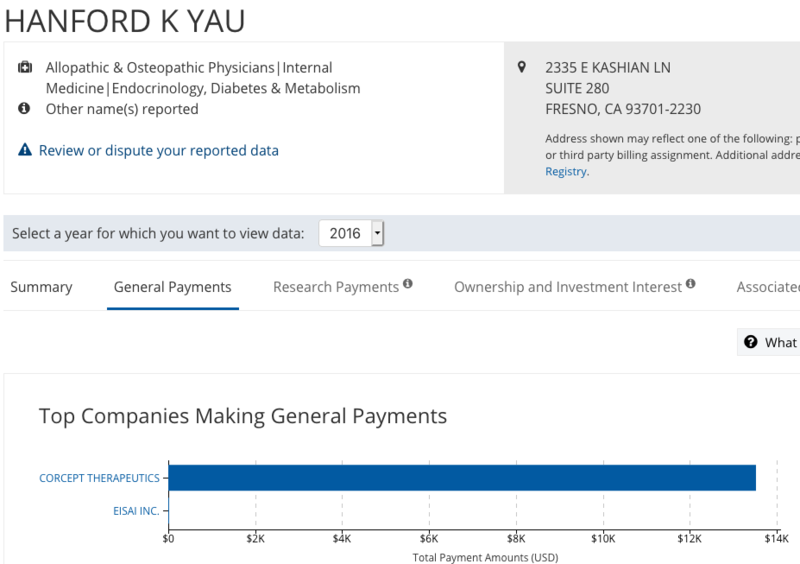 Moreover, just as his clinic had become so central to Corcept’s economic well-being, Dr. Yau became the company’s leading recipient of speakers bureau payments. In 2017 he received $95,139 from the company — over 12 percent of Corcept’s total payments to medical professionals — a more than sevenfold increase from 2016’s $13,524, according to the Centers for Medicare & Medicaid Services’ Open Payment Data portal. (But in 2014 and 2015 combined, Yau was paid just $4,610.) The second leading recipient of the company’s speakers bureau cash in 2017 was Dr. Joseph Mathews of Summerville, South Carolina, who was paid $73,777. 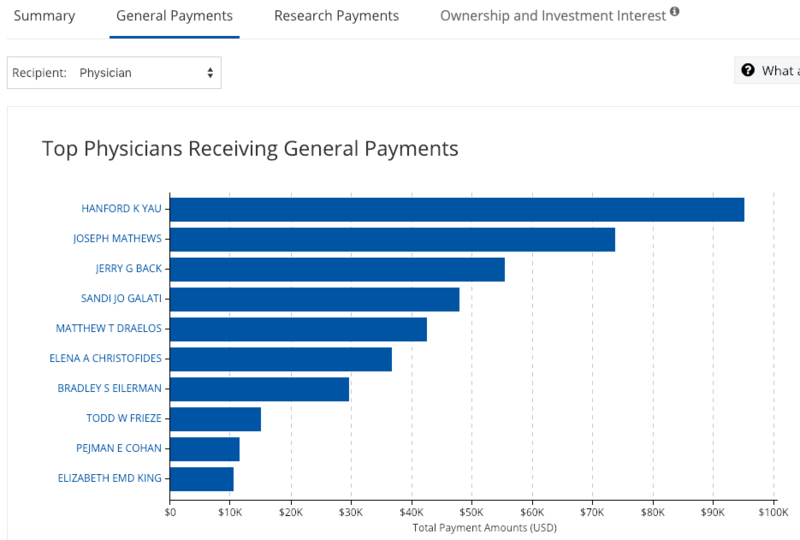 None of these payments were for research purposes, according to the Open Payments Data portal. Nor does Dr. Yau’s name surface on ClinicalTrials.gov, the U.S. National Library of Medicine’s database of public and private clinical studies. 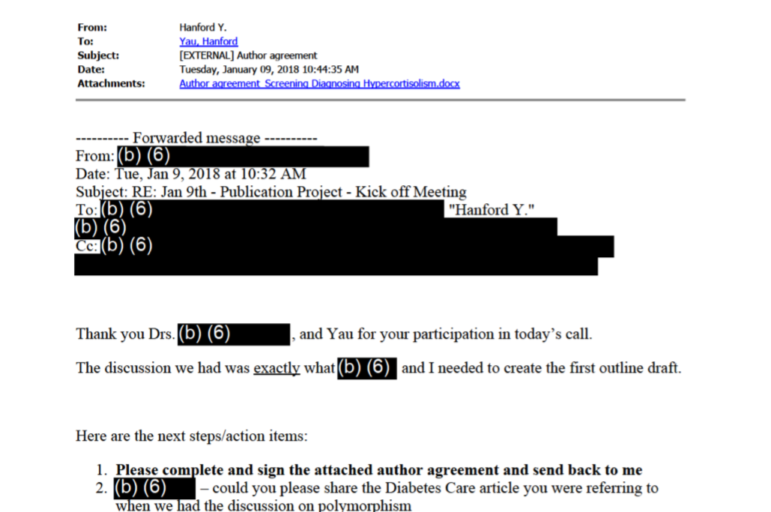 Asked several times about this doctor’s relationship to his company, CFO Robb would speak only in broad terms about the speakers bureau program’s goals without discussing Dr. Yau. He did not answer a follow-up question sent via email. And Dr. Yau did not reply to a phone message or email. In addition, the fact that the Orlando VA Medical Center generates so many Korlym prescriptions is rather curious. The patient base of the VA’s medical system nationwide has in recent years been more than 91 percent male, according to the department’s analysis of those using its services from 2006 to 2015. But Cushing’s syndrome typically occurs in women rather than men, by an almost 5-to-1 ratio, according to the National Organization of Rare Disorders. 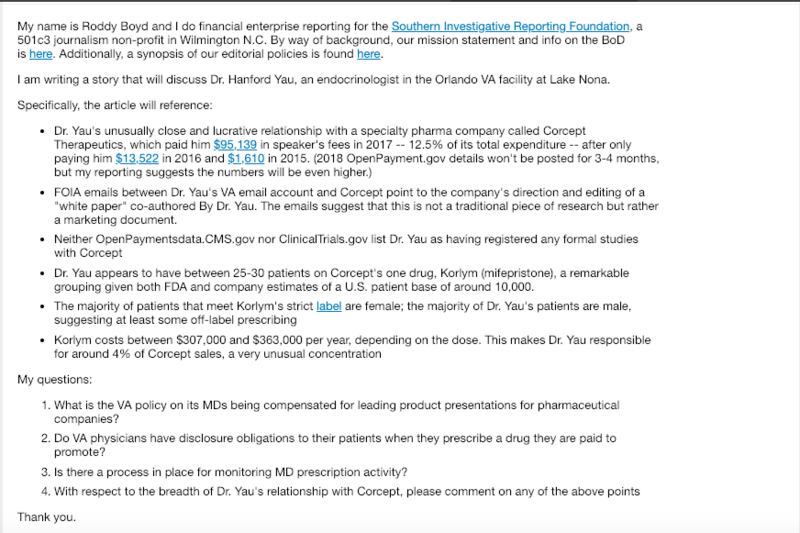 Susan Carter, a VA spokeswoman, did not reply to several calls and an email seeking clarification about Dr. Yau’s prescribing of Korlym and compensation for serving as part of Corlym’s speakers bureau. Editor’s Note: This story was amended to include two paragraphs discussing the natural limitations of the FDA’s Adverse Events Reporting System and the Southern Investigation Reporting Foundation’s approach to reporting with this data. Singapore — Few companies can explain their meteoric growth as alluringly as Wirecard AG. In one preferred narrative, Wirecard presents as Europe’s leading financial technology innovator, a globe-spanning developer of white label code and applications that remove the friction from electronic payments for both merchants and consumers. Who payed you to write this article? The short percent in CORT is 25 % and article like yours are design to depress the stock price. If things had been as bad as you describe it, the police would be involved and the CEO would have been in jail. This is not True and government cannot keep it going for longer term. This is ridiculously wrong. This Article seems to be designed to cause problems for CORT. This article is hysterical. Astounding how many misrepresentations are littered in this piece of “investigative journalism”. Also – if the market segment is so small. And the drug really so marginally effective, why is TEVA in the midst of a lawsuit with this company to bring the generic to market ASAP. Come on people – think before you let someone like Roddy and his clown shoes aptitude influence your investment decisions. What a load of crap. Where did you get this info from? And who PAID YOU?? Do you really think that corcept just got some pass from theFDA because they’re special? And all the deaths you claim from this drug – please show us where you got this. Shame on you for this irresponsible reporting. Investigate journalism at its worst. Laughable and transparent. Agreed this article is laughable! Making claims with no solid evidence to back it up. Hopefully people with brain will see through this. I read the report carefully. The author presents nothing but guess work. He has no any evidence to show Korlym is ineffective. Rather, he cites something else, which in my opinion, to vilify Korlym. Let’s look some what he said. We can interpret that mifepristone has other medical functions besides abortion. The author doesn’t provide any reference of it. Well, assume it is right. That means FDA think it’s sufficient study for Korlym. In regards to FAERS, the report have detailed what Cort’s CEO explanation which perfectly make sense. The vast part of report is questioned Cort’s marketing strategy. Well, there is nothing wrong for Cort to partner with local doctors. I’m Accountant, and from time to time, I am approached by accounting software providers who want me to partner with them. It’s entirely legal and normal business practice. The key issue of the report is it doesn’t present anything to prove Korlym is ineffective. Readers should not be fooled. Your views of me are your own and I won’t engage with them, but you did lay out two specific concerns regarding this story: A) (the lack of) evidence re: mounting deaths and B) that my assessment of the FDA testing procedure was problematic. 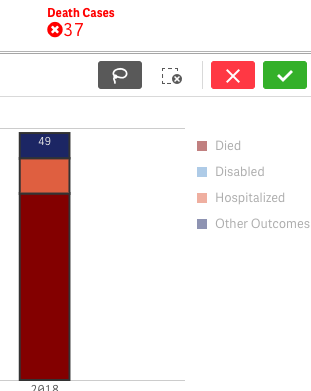 I laid out in detail where I got the deaths from: the FDAs adverse events reporting system (FAERS). The snapshots on the “37” and “17”? That’s where I got them. Enter: Korlym and click through. You’ll see I didn’t count 42 deaths that upon further investigation were clearly not drug-related. This is public data. Regarding the FDA’s investigation of Korlym: Being skeptical of an open-label, single-arm, non-blinded test with 50 participants is not harsh or unfair. That is simply acknowledging that this drug was in no way investigated with the rigor that other drugs were –and are — subjected to. The FDA approval package, which was linked to, is full of numerous examples of this being an unusual investigation. Moreover, that should be considered alongside the European Medicines Agency blunt rejection of the drug over concerns of ineffectiveness on the targeted population. These details were linked to in full. Mifepristone indeed has another medical applications beside abortion — its use in treating Cushing’s syndrome (an earlier attempt to treat depression proved both controversial and unsuccessful.) The FDA documents: the approval for the Orphan drug application, the formal approval letter and the FDA risk assessment and remediation document, are all linked and all of them cross-reference these points with each other. There is simply no way around the fact that its trial was exactly as described: 50 patient, open- label, non-blinded, no comparator arm. I have no idea of the rules of disclosure required to maintain your CPA, but an MD is a bit different. There’s nothing wrong at all with a pharmaceutical company seeking — and paying for –physician input, and as I wrote, speaker’s bureaus serve a real purpose. But most people would want to know if their MD is in the end working for them, the patient, or some other company because of motives. I don’t want my MD to give me a script because she has a monthly quota to fill; I want her writing it because her view is it’s best for my health. Additionally, regardless of what we think, the federal government mandates that those MDs who have a commercial relationship have to disclose it to CMS. None of the MDs who did many dozens of speaking gigs for Corcept (including sometimes 2x/day) are doing any research for the company. Thanks Roddy for your reply. A couple of points here. 1. You do agree that Mifepristone indeed has another medical applications beside abortion. But at your very front part of report, you state “its sole drug is none other than the abortion pill.” This is very misleading. No many people are patient enough to read the whole report. They may just read stop here and regard Korlym as abortion pill, which is entirely not true. 2. FDA only selected 50 patients for study and then approved Cort’s application. That’s the fact. But as your report mentioned, the number of patients for taking the drug treatment is only 5,000 in entire nation. 1% of sample is not that bad. Very important “A separate open-label extension of this trial is ongoing”, which means there is continuing study by FDA to monitor Korlym effectiveness. 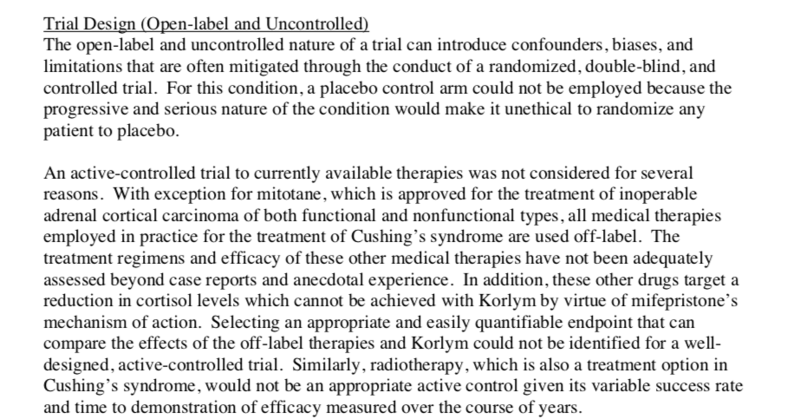 Given the fact that FDA hasn’t given any different opinions in regards to Korlym since initial approval in 2012, we can reasonably say Korlym is good for Cushing’s syndrome treatment. Frankly say, I got notice of your report from Seekingalpha website: https://seekingalpha.com/news/3426124-corcept-6-percent-bearish-report. On the website: it clearly states that you say Korlym (mifepristone), is MERELY a repurposed abortion pill. I think this has attracted large attention, including me! I am SO thankful for this article, Roddy. I run a patient support group for Cushing’s patients, and I have been highly skeptical of Corcept and their aggressive marketing of this drug. We’ve seen many Cushing’s patients given Korlym and subsequently have major side effects. One almost died; she spent months in the ICU in liver failure. It sounds as if your detractors here are only investors, and not medical personnel, so their comments are the way to try to pump up the stock price. I happen to be worried more about my patients’ health! One should not make assumptions such as the one you implied. I for one am NOT an investor. Having said that you might want take this same rationale and apply it to the author of this article, perhaps you are not familiar with him. I’m not an investor and no one affiliated with SIRF is either. The woman made a reference to someone she knew who was ill and expressed an opinion. You’ve established you don’t like me or the article — got it. So does everyone else. Please try and be constructive. Thanks. I agree with you mike. I wish though who come across this have a brain and see through this. This article and some of the comments are laughable. No solid evidence except for hearsay stories. Thank goodness Facebook keyboard warriors aren’t the drs in charge. I AM that patient! I can assure you that prior to taking Korlym I had perfectly normal liver enzymes. Within 4 months I was hemorrhaging so badly that I needed two transfusions. I was virtually bedridden by month 6 vomiting multiple times a day, that my prescribing doctor ran a series of tests. At that point my liver enzymes were 3xs normal. I was told to stop the drug immediately. I went to a gyno in order to receive a hysterectomy, my liver and spleen were so swollen the had to perform the procedure open rather then laparoscopically. Once in surgery, due to the anesthesia my liver tilted. I spent 98 days in UPenn clinging to life. I was given last rights on Feb 13 2013.. it’s by the grace of God I’m still here, but I have significant fibrotic damage to my liver. The big wigs at corcept befriended me, asked me to be a spikes person, had me videotaped to tell my story to help bring awareness. Once I had adverse effects, they dropped communication with me faster then a speeding bullet! I went from hero to zero! Those early impurities?? Hmmm. Also, I happen to know that their prior failed, unreported studies might have had adverse liver side effects.. but conveniently for them, we’ll never know. Not sure what your relationship with Korlym is, or how you know so much, but liver failure IS in fact a side effect of taking this drug. I took it for 2 months, and it made my symptoms even worse, so I stopped taking it. I do have Cushing’s AND Diabetes so I was a prime patient for them to test it out… I will warm ANYONE to stay away from this drug! I have no affiliation with korlym. I think you may have this drug confused with a well recognized cortisol lowering drug that has a box warning for this issue. The FDA does not look the other way for Corcept, they just don’t get a pass. I’m sure there are some one offs with any drug or other medical issues going on (known or not) that play into issues but there is no basis in fact regarding this drug and liver failure. Are you REALLY telling two people who almost DIED from a prescription drug that they are confusing the two drugs? I assure you, I know these women and know that they know more about Cushing’s and any available treatments than most of the Corcept employees. The drug you are speaking of is ketoconazole, an anti-fungal that has been used for many years to lower cortisol levels. It does have a black box warning, and it has been shown to adversely affect liver enzymes. Why does it have this warning? Because it went through the proper testing procedures, and has continued to be monitored over the years. The black box warning is specific to prescribing for dermatological issues for which there is no other appropriate anti-fungal. The question is really this — why does Korlym not have a similar black box warning? The number of adverse hepatic events is not a low percentage of users of the drug. Perhaps one of the problems with Korlym is that Corcept has not been honest about the various side effects. I assure you that liver damage is one of them … no matter what “adverse events” are listed. Susan are you really suggesting that korlym has not been held to proper testing and reporting protocol since it came to market almost 7 years ago? I’m sorry but the FDA just doesn’t turn a blind eye to anyone. And while I’m sure these folks know a lot about their illnesses I certainly do not believe they know more about the science and mechanisms behind this drug than the researchers and scientists. I’m certainly very glad they’re fine, but let’s keep this sensible. ..and the black box warning for keto is NOT only specific to derm uses – it’s specific to all uses – your liver doesnt know the difference. That’s the end of this discussion for me – too off base and way too medically incorrect. Feel free to respond if you feel you need to but I’m not going to banter with you anymore. Why haven’t you disclosed in the article if you, your hedge fund father, associates, friends or family members shorted the stock before the article was printed? It’s suspicious that the stock dropped sharply the day prior to publication, while the general market was up. The SEC should look into this. I have nothing to disclose; I am an established investigative reporter and no one affiliated with SIRF has an economic interest in what we write. Perhaps you should read the “About Us” tab and especially the “Donors” tab. There’s even a Primer for people like you, who see hobgoblins where none exist. My father Mike Boyd ran a convertible arbitrage hedge fund that closed in 2012. The hedge fund never did equity investing and most especially, never employed single-stock shorting. He is now retired, and devotes his time to travel and raising money to build out a soup kitchen back in Ct. (where I’m from.) His investments are in land/real estate, ETFs and one stock, $MU. Beyond that he is in cash. He’s never provided me a tip and I’ve never asked. You are free to dislike me, this article and SIRFs body of work (and/or my other reporting) for whatever reasons you choose. But bring up lies about my motives or family again? You are banned. This is the first and last time this gets discussed here. Inference ( 1 ): that efficacy of the drug was not demonstrated because the trial consisted of only 50 patients and because a comparator arm was not used. Facts: Cushings is a rare disease. At the time of the trial, it was estimated that about 5,000 people suffered from the disease. It would be difficult to recruit patients for trial from this old and sickly population. The FDA determined that a trial of 50 patients would suffice to test the efficacy of the drug. The FDA also determined that a single arm study would suffice because it would be inhumane to have some patients, from this population, take a placebo. The FDA then determined that the trial demonstrated that the drug is effective. Doctors prescribing the drug also deem that it helps their patients. Conclusion: the author has no basis for inferring that the drug is not efficacious. Inference ( 2 ): that doctors were paid to prescribe the drug. Facts: Pharma companies pay doctors to promote drugs. Prescribing doctors are paid to speak at symposiums to recount their observations of patients using the drug. Doctors are paid to run studies. Doctors are paid to write research reports. Conclusion: Payments to doctors is not unique to this Company. It is a common marketing practice in the industry. Perhaps it can be argued that pharma companies should not pay doctors, or that former generals should not serve on the BOD of defense contractors or that former presidents should not accept $100K payments for speeches; but it is what it is. To single out one company and infer that the payments were illicit is yellow journalism. Facts: The author looked at a list of prescribing doctors ranked by the number of prescriptions written. He singled out the doctor at the top of the list, who works in a Virginia clinic; and points out that nearly 84 patients at the clinic during a three year period were prescribed the drug. He didn’t interview any of the patients but is making the inference that this doctor prescribed the drug to patients who did not need it. Conclusion: There is no basis to name a doctor that is the highest prescriber of any drug and infer that the doctor is prescribing the drug to patients who do not need it. According to the latest estimates, there could be 11,000 patients with Cushing’s. The state of Virginia contains 2.6% of the US population. So there could be 270 patients in Virginia with Cushing’s. Having 28 treated annually at this clinic doesn’t seem that out of the ordinary to set off alarm bells. The inference that the doctor is unethical is baseless. It makes the author look desperate trying to make a case while grasping at straws. On what basis are you saying that Cushing’s patients are “old” and sickly. I agree we are sick, but like any other disease, there are various levels of sickness and functionality. Cushing’s affects all ages, including children. It’s not as common, but people of all ages are fair game when it comes to Cushing’s. If you’re going to try to correct someone, make sure you aren’t misspeaking while doing it. Interesting is when the article was released …just timed during lunch time at the trading desks… this guarantees a large drop for the stock. In my option this article was not helping patients it helped “unknown” people to make a lot of money. Comments are moderated. I’m just getting to them now. I hope this clears it up for you. I find it particularly interesting that you fail to mention the Support Program for Access and Reimbursement for Korlym (SPARK), Corcept’s charitable program that provides Korlym for patients that cannot afford the drug or do not gain prior approval from their insurers. Further, the ~150% price increase of Korlym since 2012 does not mark a significant deviation from other specialty pharmaceuticals for the given time period. Obviously, when used out of context like in this article, the figure seems excessively high. I really see nothing interesting or compelling about the “clustering” of scripts coming from any particular geographic location. Patients do not have to live in any particular city in order to see any doctor – most probably these drs have a lot of experience treating cushings patients and therefore the number they see is much higher; patients will go to the moon to try and find a dr that’s saavy about this condition – it is one of the most challenging endocrine diseases there is, if not the most. Many endocrinologists see ZERO cushings patients in their entire career, some see enough to be dangerous and know so little that patients end up going from one dr after another to find a knowledgeable one who can/will help them. It’s extremely concerning the number of endocrinologists that do NOT know how to diagnose nor test for cushings, eg thinking they can rule out with a test or two. There are not just experienced drs in every town that patients can avail themselves. I also, along with Susan, have seen many suffer and some die from using this product. The question I have, however, is why use it at all? It is not a long-term solution to hypercortisolism. The source still needs to be found and, for long-term, surgically removed. There are no other alternatives for long-term solutions. Why use this potentially devastating drug at all? Bilateral adrenalectomies and transphenoidal endoscopies have excellent outcomes for patients with much less chance of morbidity and mortality when done by surgeons who have experience doing them. The Southern Investigative Reporting Foundation published a report Friday on Corcept Therapeutics. The report implies that rising deaths among patients on Korlym are related to off-label prescription and that Corcept is encouraging overprescription by compensating physicians. CORT traded down as much as 15% on Friday in the wake of the report. I argue that the report missed the mark, falling short of sophisticated analysis and mischaracterizing circumstantial evidence. The other day, the Southern Investigative Reporting Foundation (SIRF) published a report on Corcept Therapeutics (CORT). 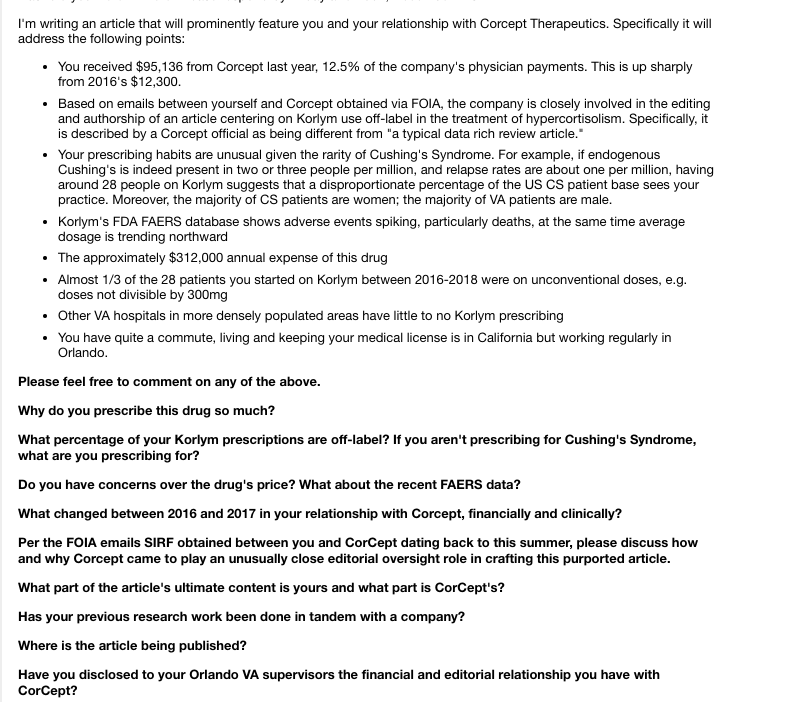 Corcept Therapeutics is a small pharmaceutical company that markets Korlym (mifepristone) in a rare disease called Cushing’s Syndrome, a condition that results from excessive exposure to the cortisol. In this report, the author vilifies Corcept as an example of some of the leading problems in American healthcare. Although SIRF maintains they are free of COIs related to short-sellers, the report reads more like an exposé by a short seller rather than an honest piece of investigative journalism. The tone of the article misconveys the author’s intent; where I had hoped that the piece would be a well-constructed criticism of ethical concerns in the drug development ecosystem, I find that the research lacks substantive analysis, and the rhetoric misdirects the reader in an attempt to stitch together a cohesive narrative. The evidentiary standard falls short in many cases, leading to speculation and insinuation where I had hoped to see a compelling analysis. Sadly, I think the author misses the opportunity to construct a more thoughtful dialogue on the ethical problems faced by the healthcare system in an attempt to capture shock and awe. I want to highlight the relevant ethical points here so that the reader can keep these in the context of my responses to the original work. Has multiple clinical stage development programs in oncology, NASH, and psychiatric indications. This odd combination of factors attracts an unconventional class of investors that has historically led to inefficiencies in the company’s share price. The company tends to attract rare disease investors and institutional investors attracted to Corcept’s bottom line. Interestingly, Corcept’s development programs are largely overlooked by the oncology crowd because hormones are not vogue. Here, I will comment on the most prominent points raised by the author. It takes a stretch of the rhetorical imagination to construe that the FDA indicated this was a flawed trial. There are very real and very relevant criticisms of single-arm, open-label trial designs. At the time, the FDA clearly cited that a randomized controlled trial was not possible and made the decision that the potential benefits of Korlym approval outweighed the associated risks. Which again is a misrepresentation. An open-label study is unequivocally less rigorous than a randomized controlled trial, which is the gold standard in clinical medicine. However, an open-label study can prove substantially more rigorous than many other scientific investigations, such as a retrospective or case-control study. In this case, the FDA allowed the single-arm study because it was gauged to be the next best option where an RCT was not deemed viable. Regardless, this discussion is now seven years old and soon to be obsolete. Relacorilant, Corcept’s successor to Korlym, which has been designed to be more potent, while minimizing adverse side-effects such as pregnancy termination, is being studied in a pivotal ongoing Phase III trial that is double-blinded and placebo-controlled. The results of that trial, expected in 2020, should help eliminate ambiguity about the activity of glucocorticoid receptor modulation in Cushing’s. The future of the company is about Relacorilant, not Korlym. Here, the author insinuates that an increase in 2018 in deaths among patients using Korlym could be related to off-label usage of the product. The author’s work here lacks substantive analysis. To start with, there are a number of limitations to data in the FAERS database reported by the author. Firstly, the FDA states UP FRONT that there are duplicate and incomplete reports in the system, that information in the reports has not been verified, and that rates of occurrence cannot be established with these reports. Furthermore, the reports referenced by the author are analyzed based on when the report is received, not when the incident occurred. Segmenting by when the incident occurred, only 26 deaths were reported as occurring in 2018. The rest occurred in a previous year or contain missing data. Finally, the author inappropriately cites a reference to absolute death counts. With an increase in the number of patients treated with Korlym each year and a proportionally larger increase in the number of patients previously treated with Korlym, it is reasonable to expect some increase in the number of deaths reported each year in patients treated with the drug. A more useful statistic would be to report the number of annual patient deaths per year as a percentage of all patients treated with Korlym. Taking one look at the FAERS data, it is clear that some of the reports are incomplete. After a third party with expertise in pharmacovigilance reviewed and cleared each case, to cite “product used for unknown indication” among patient death reports and imply this in some way comprises negligent corporate conduct is inappropriate. Cushing’s disease is a dangerous disease – as stated by the FDA, most patients die within 4-5 years without treatment. As highlighted by the Corcept CFO, some of these patients are taking as many as 20-30 medications concurrently. There are many potential confounds that make a brief glance at raw data from an incomplete database inadequate. To claim that deaths among Korlym patients are rising, and to imply that these deaths are related to the drug, is sensationalizing inadequate data. Here, the author sneaks in a couple of points. Firstly, the author notes that speakers’ bureaus are a legal practice whereby physicians receive compensation for professional activities discussing the use of the drug. The author also notes that these arrangements can devolve into quid-pro-quo relationships, an important conflict of interest in pharmaceutical marketing and sometimes illegal practice. As it relates to Corcept, the author observes that many of the physicians writing the most prescriptions for Korlym have practices in rural settings with a reduced population and suspects that these providers could be overprescribing Korlym by including patients with diabetes and not just Cushing’s. Cushing’s disease, after all, is a rare disease, and it would appear unlikely that we see more prescriptions occurring in a rural setting where there are less likely to be as many patients, as compared with larger, centralized institutions. I present an alternative thesis that is not mutually exclusive with all of the author’s original points but nonetheless tells a less insidious story. Korlym has faced significant challenges with uptake in rural, predominately conservative, pro-life areas. Korlym, aka mifepristone, is well-known as the abortion pill. While the drug is used effectively to manage some of the effects of excessive cortisol in Cushing’s, pregnancy termination remains a controversial side-effect. Resistance to prescription is exacerbated by the demographic of Cushing’s patients. As the author notes in an unrelated discussion, Cushing’s occurs more frequently in females than males by a factor of five, where pregnancy termination is a viable concern. Many physicians may refuse to adopt Korlym because of personal pro-life beliefs. Interestingly, when you look at the political representation for the districts containing top, individual Korlym prescribers, we see that the clear majority of them fall in conservative districts. Sure, it is unlikely that Zanesville, OH, organically saw 39 patients in their 25,000 person town present with inoperable Cushing’s. However, consider that Dr. Mohammad Ijaz could be the only practicing endocrinologist in the region that (1) has experience tackling a difficult diagnosis, (2) has treated hypercortisolism with Korlym in the past, and (3) is ethically willing to prescribe a drug known to cause pregnancy termination. Tack on the fact that Cushing’s disease is rare and exceedingly challenging to diagnose, and is it really all that surprising to believe that some specialty providers may receive more patients? In light of all this, there are many ways to question the data presented by the author. Do the top prescribing physicians prescribe Korlym because they receive Honoraria from Corcept? Does Corcept pursue speakers for the bureau because they are top Korlym prescribers? Or perhaps, do industry leaders both attract the most patients to their clinic and represent prime candidates for the Corcept speakers’ bureau? On one hand, you can make the argument that any amount of compensation is too much. Personally, I think it is a reasonable business strategy to use legal, professional avenues to promote awareness regarding treatment options for a rare disease in communities where there is traditionally resistance to the side effects of that treatment. Cushing’s disease is challenging to diagnose, many patients must visit multiple clinics before receiving an accurate diagnosis, and the disease remains largely underdiagnosed. Pro-life physicians may choose not to prescribe Korlym because of side-effects relating to pregnancy termination, restricting treatment options for patients in conservative districts. To overcome barriers to patients receiving the most possible options for treatment, Corcept provides compensation to physicians for legal, professional engagements to discuss their experience with Korlym administration in Cushing’s patients. As an addendum, Relacorilant, Korlym’s successor, is safer, more tolerable, and does not cause pregnancy termination. Throughout the report, the author insinuates that Corcept is promoting off-label usage. Off-label drug usage falls into an ethically challenging gray area. In some instances, off-label drug usage has significantly expanded treatment options for patients. For example, off-label avastin usage provides an effective treatment option for patients with age-related macular degeneration (AMD) that cannot afford the gold-standard Lucentis. Both drugs are marketed by Genentech. Avastin is orders of magnitude cheaper but is approved for use in cancer, not AMD. That being said, one of the reasons that the FDA exists is to prevent large corporations from taking advantage of patients with serious diseases. There are a few things that I think about in this case. Firstly, has Corcept actually promoted the off-label use of Korlym? The investor should consider this a possible risk, but at this point, there is next-to-no evidence to support this claim. The author needed to dig deeper than producing circumstantial evidence from one physician in Orlando. Secondly, has patient harm resulted from the off-label use of Korlym? Finally, due to the possible underdiagnoses of Cushing’s disease, does off-label usage expand a treatment option for underserved patients? Off-label usage is further complicated by Korlym’s secret double life as the abortion pill. Naturally, access to mifepristone – Korlym or otherwise – is controlled to prevent back-alley access to mifepristone. I have seen no evidence that Corcept is promoting off-label prescription, illegally or otherwise. 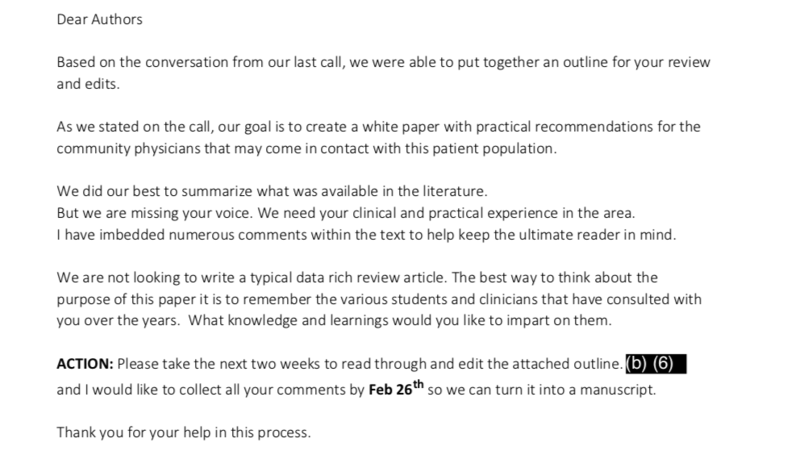 The author shows an email chain where Corcept encouraged the development of white paper guidelines in collaboration with physicians. This claim comes out of left-field and misleads the reader. Consider the COI policy of the New England Journal of Medicine, one of the top medical journals. Investigators consult with a drug’s manufacture all the time. The expectation is that these conflicts be disclosed in the article. I don’t agree with this statement by the author. 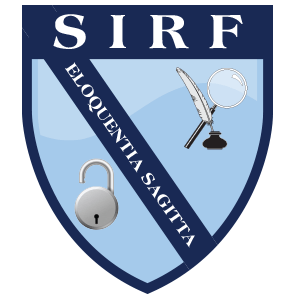 SIRF maintains its status as a non-profit dedicated to investigative journalism, and author Roddy Boyd has denied financial COIs relating to the article. However, it is worth noting that someone made a lot of money placing trades before the article was published. Originally published by @gary_weiss on Twitter. Finally, the article neglects any real mention of Corcept’s research and development activities, which makes this report egregiously one-sided. Cortisol is one of the most well-known hormones and is involved in a large range of biological activities. In addition to developing Relacorilant in Cushing’s, Corcept is advancing compounds in clinical trials for multiple indications in cancer (including ovarian and prostate cancer), NASH, and mental health. Corcept has more partnerships with independent investigators than I have ever seen in a company their size. According to Pitchbook, the last time the company has raised outside money was in 2012, meaning that all of these programs have been supported by the high price of Korlym. Has Corcept done anything illegal that risks incurring substantive legal action? Is any of the new information in the article likely to affect Corcept’s ongoing business operations? In my opinion, this report will blow over, and Corcept has again become undervalued. I used this opportunity to buy back shares that I sold last month after the new Korlym patent was issued. Take a minute to read the following, and you will quickly realize the claim regarding all the “deaths” supposedly linked to korlym has no basis in fact. How this angle was used as a pillar in this article is beyond comprehension. I’ve written bluntly about the limits of FAERS as a data reporting system (see this article on Acadia Pharmaceuticals, specifically the paragraph about 1/2 way down that starts with: “These adverse event reports aren’t considered as conclusive….”) and I made extensive effort to address that. Put bluntly, FAERS reports are simply rough data that with some investigation can illuminate a trend. And, after the data is cleaned up, it’s evident there is a trend here. To start, I eliminated all instances where a patient who died while on Korlym but where the circumstances of death suggested that the drug had nothing to do it. For example, an event where the person on Korlym died after a car accident/complications from a fall/had a previous cancer diagnosis. I was helped in this analysis by speaking to pituitary specialists, as well as obtaining the longform FAERS reports on deaths that couldn’t readily be dismissed. 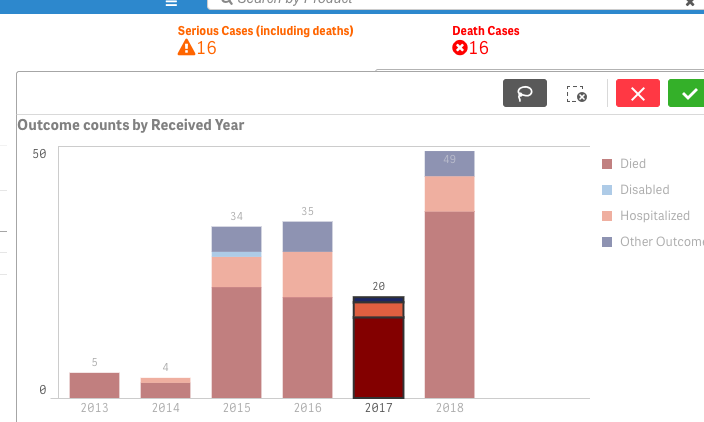 Again, while these aren’t reports of an autopsy or even proper medical files — case histories can be spotty and background information can be limited — many of them do provide valuable context and data, such as dosage, circumstances of death, basic health datapoints, prominent side-effects, initial diagnosis and duration of Korlym use. What remained were 103 people that were on Korlym (and yes, often with other drugs) when they died, where the circumstances of death don’t immediately rule out their reaction to the course of treatment. What’s that mean? A few dozen of these deaths occurred shortly after increasing Korlym dosage strength. Few would conclude that a cause of death can be determined based on that alone, but as a data point, it can’t be readily discarded either. Finally, as an added check, I looked at the rate of growth of (noteworthy) death reports versus the rate of sales growth. Why? As a drug gains commercial acceptance, its adverse events will naturally increase; if over a two-year period sales increase 35% and death reports increase by 10%, that’s a (rough) indication that medical professionals aren’t observing a lot of morbidity connected to the drug. For Korlym, that ratio was sharply skewed in the wrong direction. Finally, I outlined these findings to the company, and the CFO said every last death, when investigated, had nothing to do with the medication. I think it’s a little more complex than that. why are my responses not published? With all due respect, your own response pretty much confirms that this data cannot be relied upon. Data trends, statistics etc can be compiled and organized in any number of ways, depending on the desired outcome of the individual producing it. I feel you should have included your disclaimer regarding the pitfalls in FAERS reporting in the CORT article, and not assume someone would have seen it if they happened to read the ACADIA one. I have no requirement to repeatedly post the same disclaimer in every article in which FAERS data is mentioned, and I’d posted it several times prior to the Acadia article as well, but I’ll do you a favor — I’m going to add it to this article, so that what I’d replied to you previously is crystal clear for all to read. Now it’s my turn to be baffled: You made some fairly strong declarations about the integrity of my work yet everything you’ve written demonstrates that you have never sought to understand FAERS data and the importance of its role in monitoring drug safety and efficacy. On a personal level, please accept my apology for not including it and then, when you noted it, not dealing with it in due-haste. Given the unusually personal tone of criticism directed at me and my family over this article by numerous commenters, I clearly failed to respond to your valid concerns; instead, looking at my comments, I acted defensively. Not a good look, frankly, and unprofessional of me. See what happened to ACAD stock. When the article was published, the stock price was under 17 and yesterday it closed at 22.74. Those who read the article and exited the stock because of fear lost heavily. Excellent information, thanks to the author. It’s helpful to me now. The usefulness as well as significance is empowering. Thanks again and good luck!